A database BeeCAsia is a specimen database based on the bee collection collected in Central Asia by the Kyushu University Expedition (Head Investigator: O. Tadauchi). The expedition was conducted nine times in Kazakhstan, Kyrgyzstan Uzbekistan and Xinjiang Uygur, China from 2000 to 2004 and from 2012 to 2014. The number of the specimens is 27,427 in total at present (October 15, 2014) excluding unpublished data of specimens. 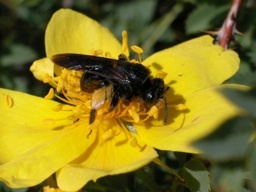 It is very important collection for the study of bee fauna in the Palaearctic Region. Each record consists of 19 items according to a format of the Darwin Core of the Global Biodiversity Information Facility(GBIF), such as scientific name, country, collecting locality, collecting date, collector, etc.